Shapeways' W/BSF (white/Black Strong & Flexible) material is a laser-sintered nylon, printed in a bed of nylon powder. That means that, although they clean off a lot of the surplus powder before shipping, there's still a lot there caught in crevices and what-not. In some areas, this powder can completely fill areas that are supposed to be void. You can see, in this photo of the Behemoth straight out of its packaging, that it looks pretty much like it's been rolled in coal dust. A certain amount of the crap can be dug out with probes and what-not, but you'll never get it all that way, and it's a tedious and time-consuming job. I thought I'd try something a bit more brutal, and gave it a going-over with my water blaster — not a tool designed for fine work, I might add. It certainly did the job, though it would be preferable to be able to use a handpiece that isn't a long as my arm, and thus a bit easier to aim at the thing I'm holding in my other hand. As well as getting rid of the surplus dust, it also revealed that the BSF isn't B all the way through, but appears to have been steeped in some kind of black dye after printing. I think that process tended to harden the deposits of extra dust, making them more difficult to remove manually. When all the extra dust is gone, the printing lines on the surface of the model are a lot more apparent. I'm not quite sure how to go about ameliorating that; maybe some kind of liquid surface filler might be in order. I've just received my latest shipment from Shapeways. They're all 1/100 scale, for 15mm gaming. This is the first lot I've ordered in the BSF (Black Strong & Flexible) material. There's no discernable difference in detail rendered, but it should make it a bit easier to paint vehicles where you can see their innards — no spots of glaring white where the primer coat has missed a bit. 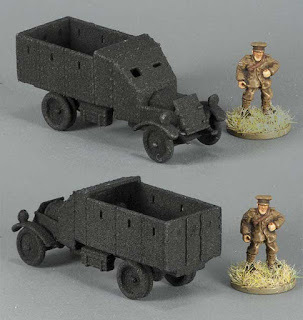 RAF airfield defence armoured car. 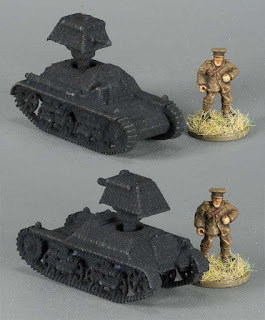 Nominally 6mm scale, but shown here with a 15mm guy. WW1 vintage, also used between the wars. 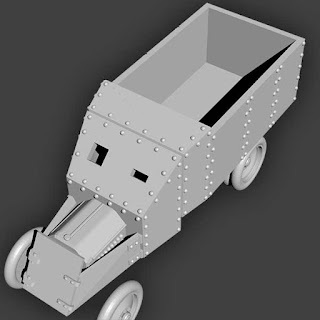 I've just finished this new model: the Lanchester Mk.II of 1930 in 1/100 scale. It was a much more capable successor to the WW1-vintage Lanchester. It's up at my Shapeways shop, but at the moment the page just shows a big banner saying "This model is no longer publicly available", which is entirely false, and apparently due to some bug introduced during their most recent systems-tinkering. The Lanchester Mk.II wasn't nearly as rivet-studded as some other vehicles of the era, and it came as a bit of a wrench to me not to sprinkle them all over the place as is my wont. I do like plenty of rivets. 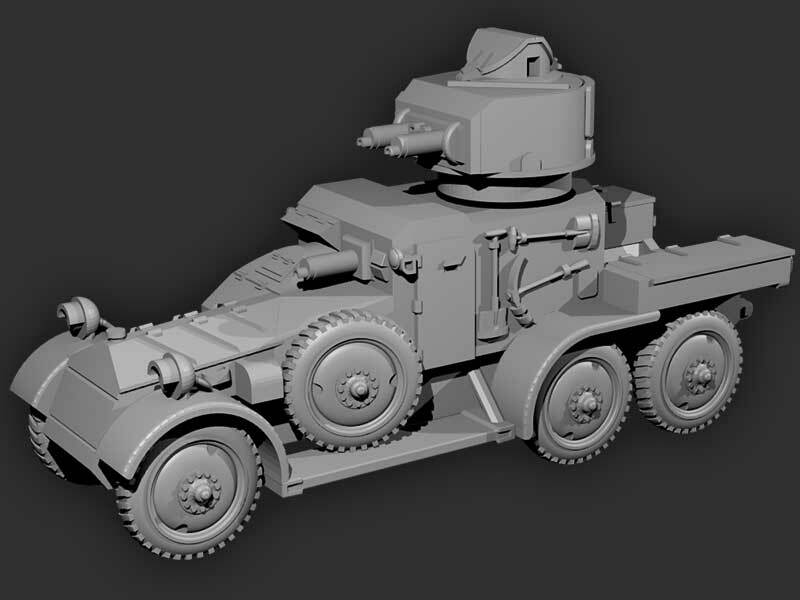 This is Battlefront's 15mm Rolls Royce armoured car, with my 3d-printed turret from Shapeways, to convert it to the 1924 version of the vehicle from their WWII Western Desert variety. I'm not too displeased with it, and it looks fine for the tabletop, but I think it might have been worth while springing for the extra few bucks to get it printed in high-resolution FUD resin rather than WSF plastic. 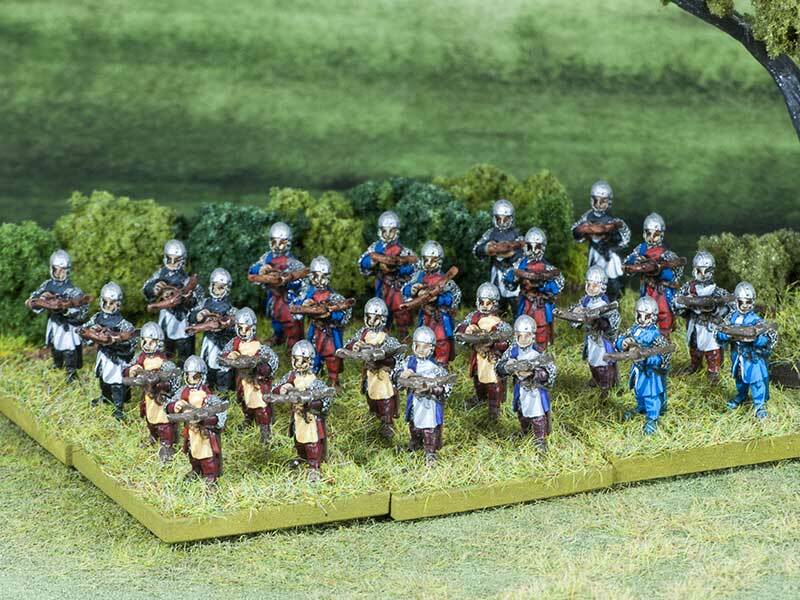 I just re-found a bunch of 15mm medievals that I'd forgotten about. I really should do something about finishing them off. 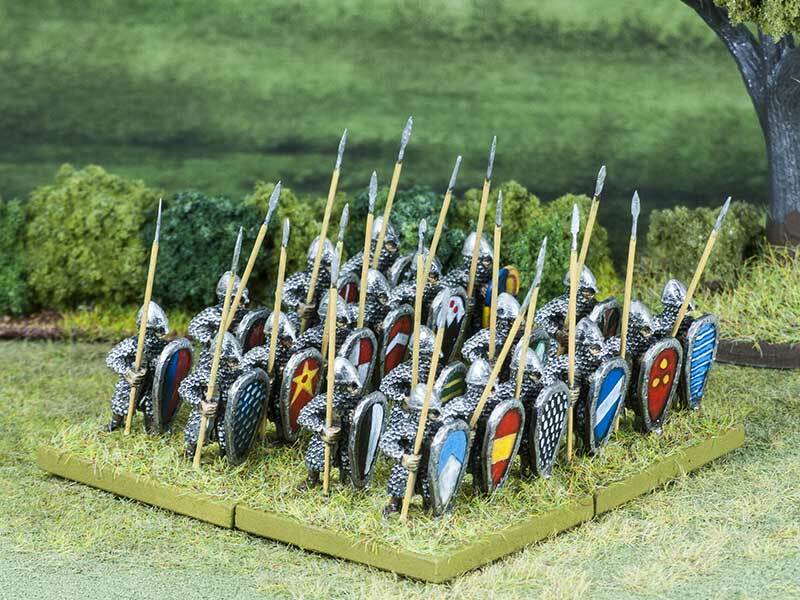 They're based on 30mm x 30mm bases for Hail Caesar. on an experimental movement tray. 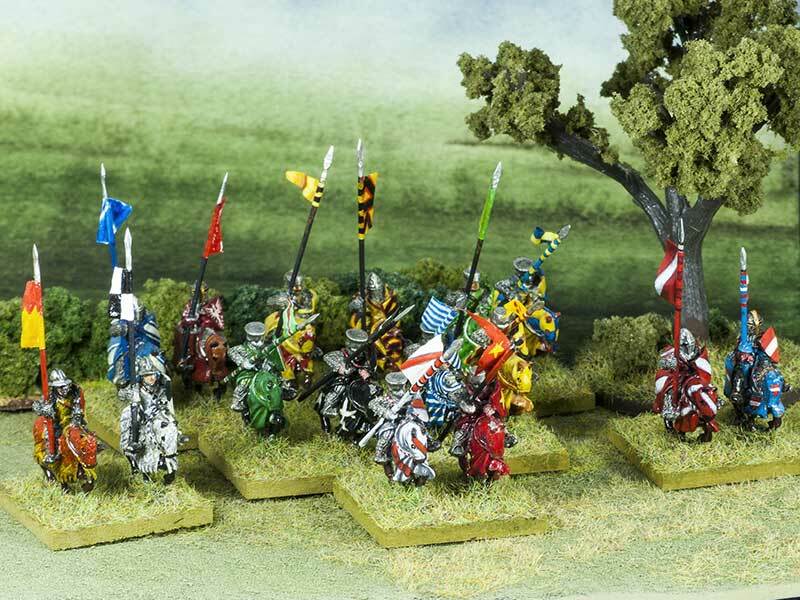 ...and certainly no match for heavy mounted knights. and a single solitary C14th-15th hobilar. 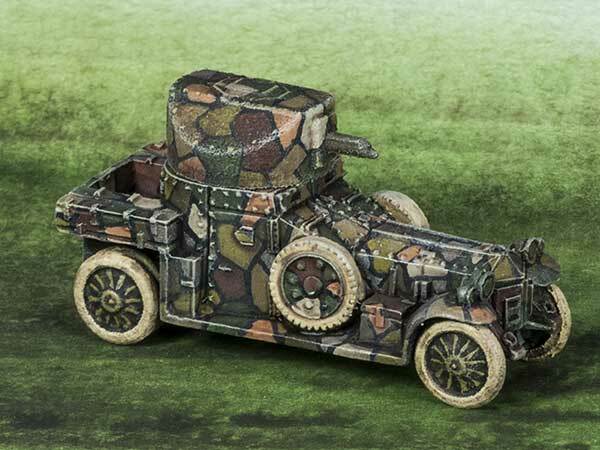 This is the Austin-Kegresse, the first armoured half-track. It was developed from the Austin armoured car, and used in Russia during and after World War One. 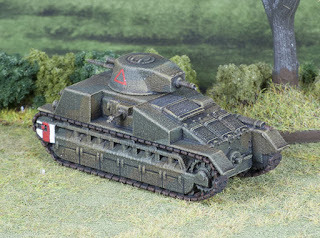 The model is 1/100 scale, for 15mm gaming. It's available now from my Shapeways shop, starting at $12.00 for the WSF version. 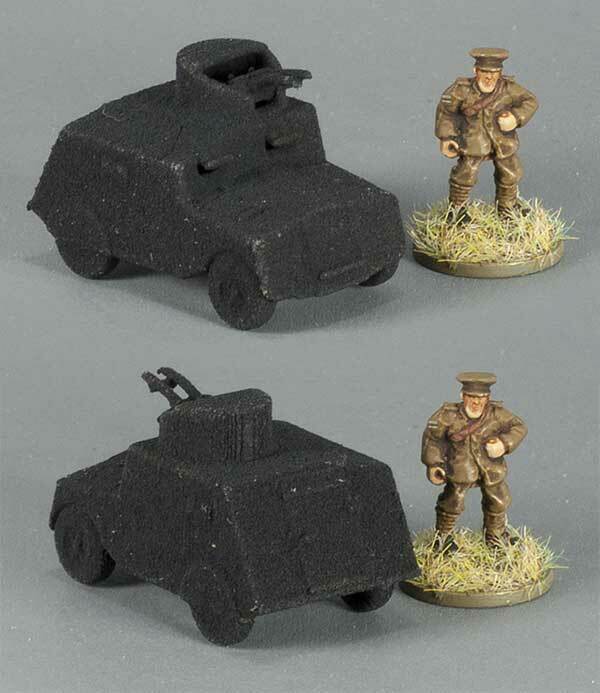 I've re-scaled the Benz-Mgebrov armoured car to 1/285 (6mm) scale. It's available as a single model for $11.50 or as a sprue of five for $16.00, which is much better value. The FUD/FED high-rez resin is a lot more expensive than the WSF plastic, but what really kills it for these tiny little models is the unit handling charges, which is why spruing them up like this is so much more cost-effective. I thought this would be easier than it was, but trying to figure out from the scale drawings just what the hell was going on up front there turned out to be a bit brain-bending. I found some old photos of Renault-Mgebrovs which were similar enough to give me some clues, but I'm not convinced that I've got it right. 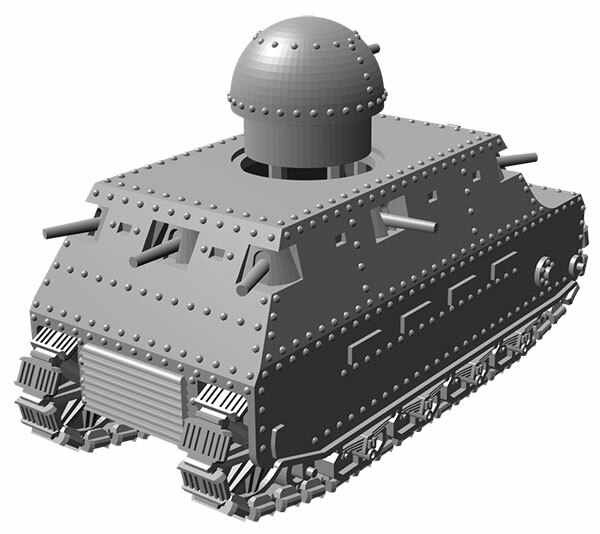 The model is 1/100 scale for 15mm gaming, and is available from my Shapeways shop for about eleven bucks. 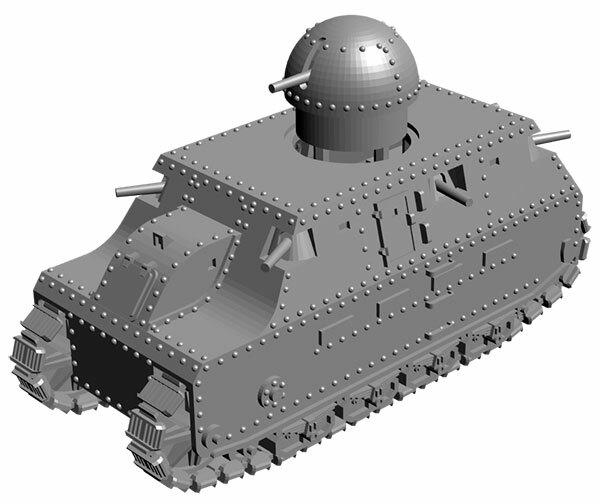 This is the last of the current batch of my 3d-printed models from Shapeways: my 15mm Vickers Medium Mk.C from about 1925. 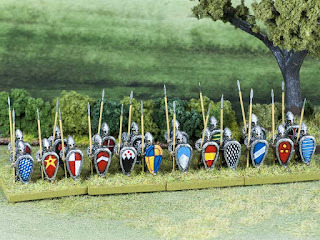 The model is also available in other scales: 1/285 (single or a sprue of five), and 1/200 scale. I'm waiting on another lot, which should be here in about a fortnight (hopefully). This is my 3d-printed 15mm Birch Gun model all painted up. It needs some crewmen added, so I shall have to see what I can find — I have some spare Peter Pig standing artillerymen, but I need a couple of seated figures as well. I spent today making this. 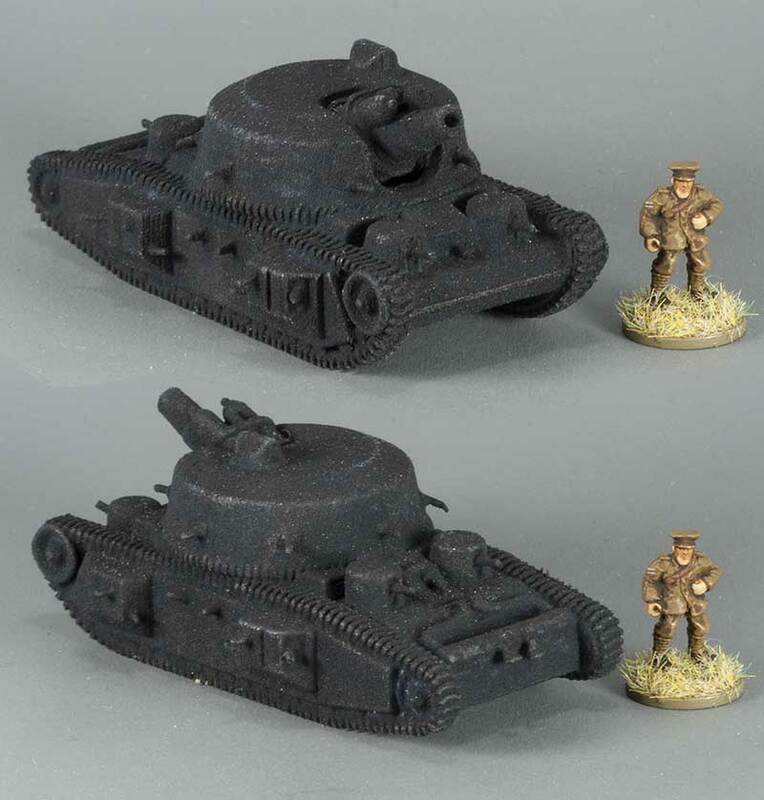 It's 1/100th scale, for 15mm gaming. 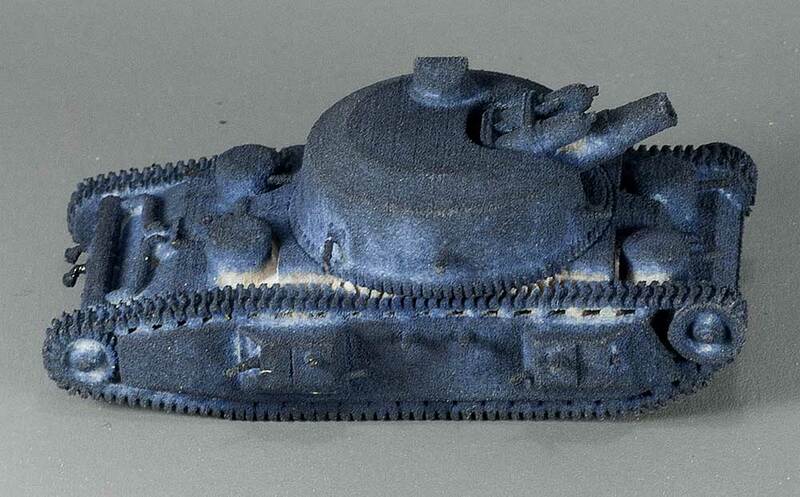 I think it's kind of cute, for a tank. It has a kind of obese, bumbling look about it, and the original was pretty damn huge too, it stood about twelve feet tall. I've put it up on my shop at Shapeways, but for some reason the site will no longer let me alter the position of the model for rendering, and I'm stuck with the default they gave me, which is of the rear view. That's not ideal, but there's not a lot I can do about it at the moment. 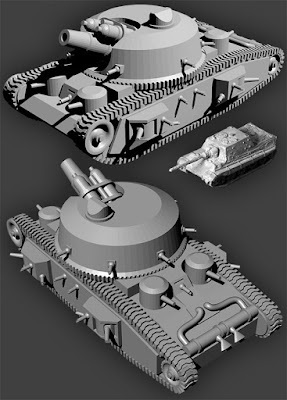 Do you make your tanks solid or hollow? — Hollow. Shapeways charges by material volume as well as machine space, so the less material I can use, the cheaper. Especially in their high-rez FUD/FED resin. If hollow, do you put in a honeycomb to add strength? — No, in these scales the walls are strong enough at the thickness I use, and honeycombing and using thinner walls wouldn't save me any material volume in the end. And how do you decide to how thick to make the walls? — The minimum unsupported wall printing thickness is 0.6 – 0.7mm; I usually make the shell walls at least twice that. When making a tube (like an exhaust pipe or gun barrel) do you go for hollow or not? — Always solid. It's less problematical. I'll maybe add a dimple in the end of large-bore guns. It's really only worth while for models printed in FUD/FED though. I'm sure there are design decisions as to whether you build from the bottom-up, or lay it down upside-down, or even end on, or on its side. I guess you find this out through trial and error? — The application I primarily use, Blender, defaults to Z-up. 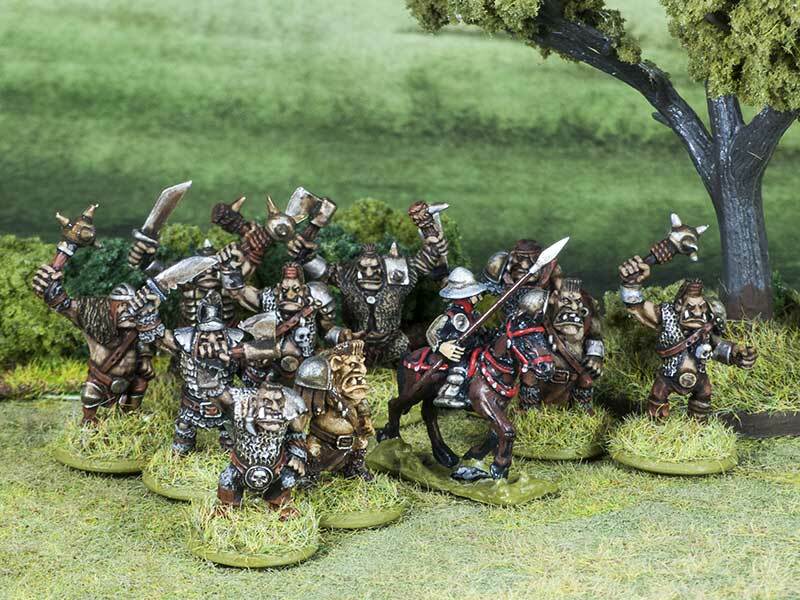 Shapeways uses Y-up for display renders. However, when exporting to .OBJ from Blender, you can set the up/down and forward/back axes. There seems to be little point in trying to design for a specific printing orientation though. Shapeways crams as many jobs into the machines as possible, which means rotating things to make them fit in any available gaps. They'll even print one job inside another, if there's sufficient clearance. Does Shapeways take the OBJ "as is", or do they "pre-process" it, and do things like build in struts to protect hanging bits, or put a cage around to protect sticky-out bits, or even put a honeycomb for large internal hollows? Or do they just "print and be damned", leaving it to the maker to fix his 3D source if it breaks during printing? — They print in a self-supporting resin powder matrix, so support struts aren't necessary. They do offer the capability to create a sinter-shell around your model to protect delicate projections and keep separate bits together in transit; it hasn't been an issue for me. I know they've been known to fiddle with separate component placement though; I read a complaint from a guy who had a bell printed outside his belltower instead of hanging inside. That sort of complaint is pretty rare though, in fact it's the only one I'm aware of. 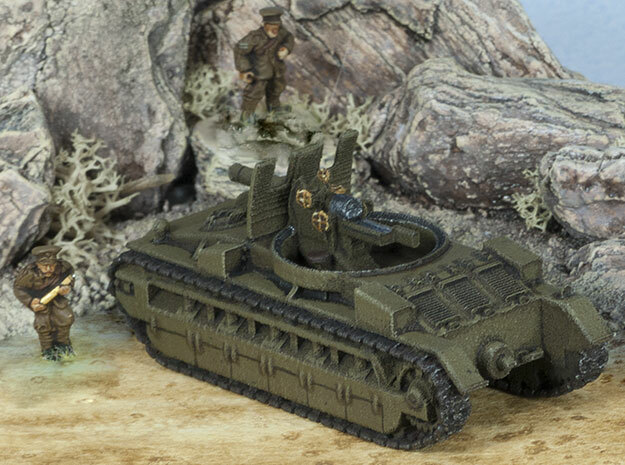 Here's my 3d-printed Vickers Medium Mk.II all painted up and ready for some gaming. I've painted up the 3d-printed Carden Loyd I got yesterday. 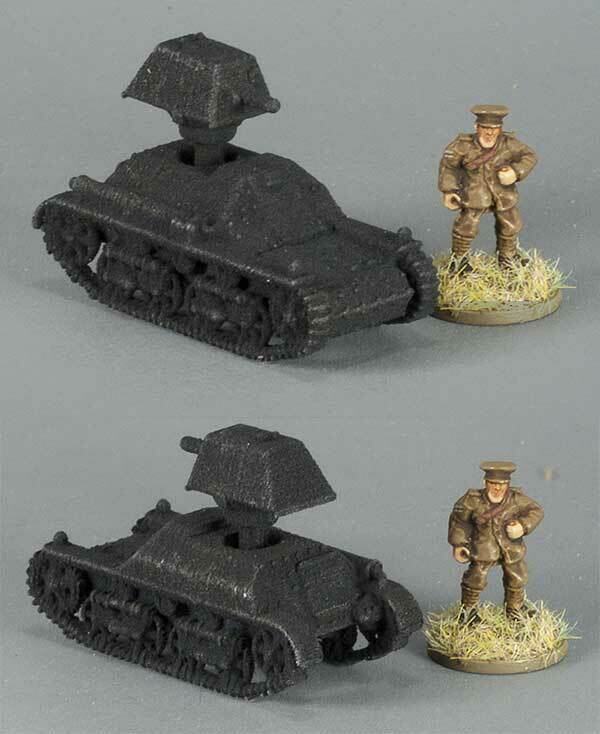 Here it is alongside a 15mm British WW1 artilleryman for scale. It wasn't a very big vehicle at all; it must have been pretty cramped, even with only a crew of two. Is there no end to them? Apparently not. 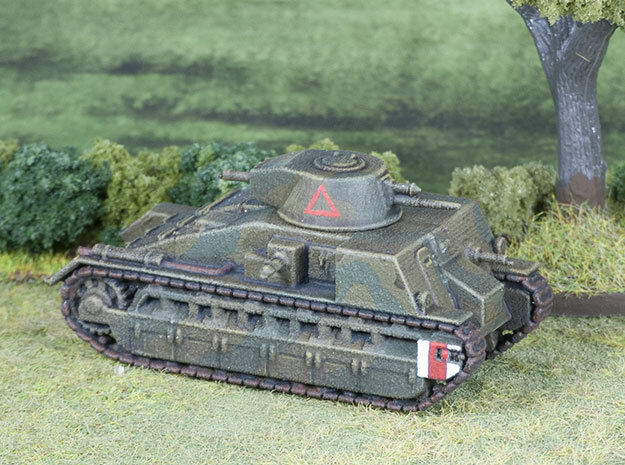 Yet another in the line of pre-WWII Vickers light tanks, this is the Mk.III. Different hull shape, different suspension, and various other changes in detail, yet clearly still very closely related to those that came before. 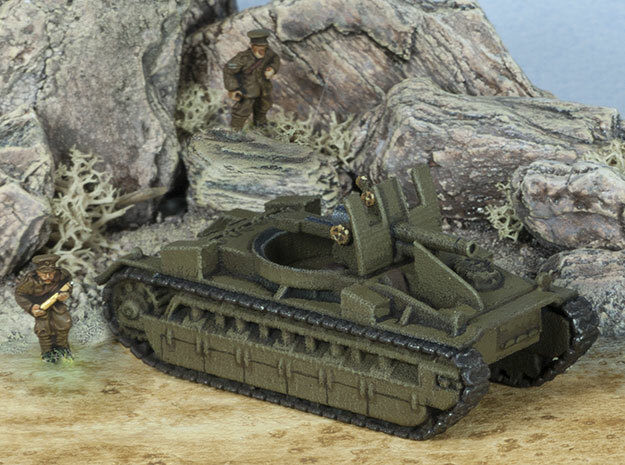 This one is 15mm (1:100) scale, and it's available from my Shapeways shop. 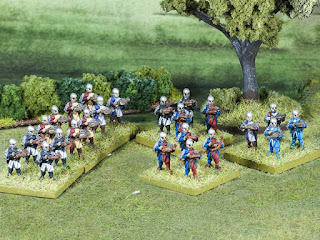 There's a 28mm version on its way right here. This is the latest batch of my models from Shapeways, all in their WSF (White Strong & Flexible) material. 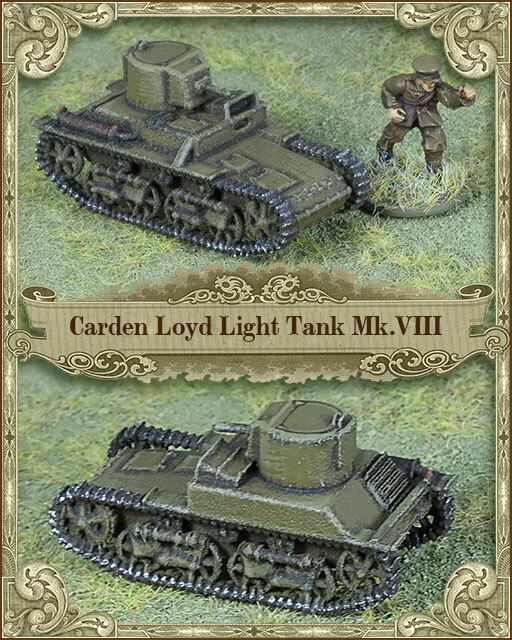 From left to right, the Birch Gun, Vickers Medium Mk.II, Carden-Loyd Light Tank Mk.VIII, and Vickers Medium Mk.C. All in 15mm (1:100) scale, and all available for sale from my Shapeways shop. The WSF plastic does resolve quite a reasonable amount of detail amongst the printing clutter. 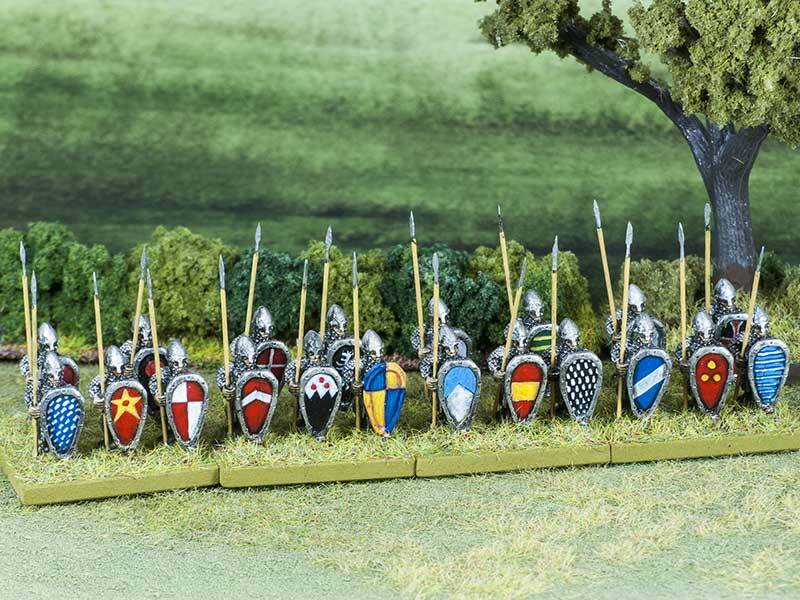 It's certainly not good enough for fine scale modelling, but for gaming pieces, it's great. It takes paint very well indeed, which is at least one advantage of having such a pronounced surface texture, and it's virtually indestructible. It would be useable for vehicles down to about 1:200 scale I should think, but anything smaller than that would be problematic — it wouldn't be worth modeling for anything more than silhouette. My next batch will be in the same stuff, but black, which should cut out a painting step. 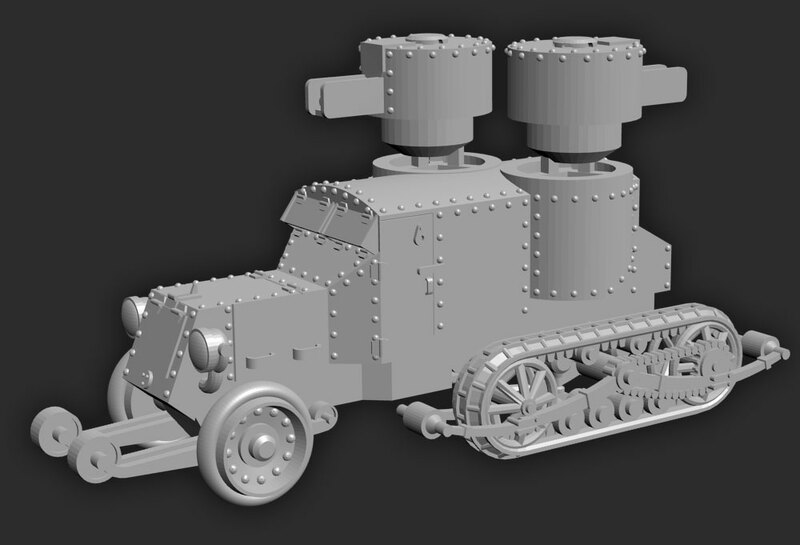 As a change of pace, and as a bit of relaxation, I whipped up this ludicrous imaginary land-dreadnought with far more guns than would ever be feasible. 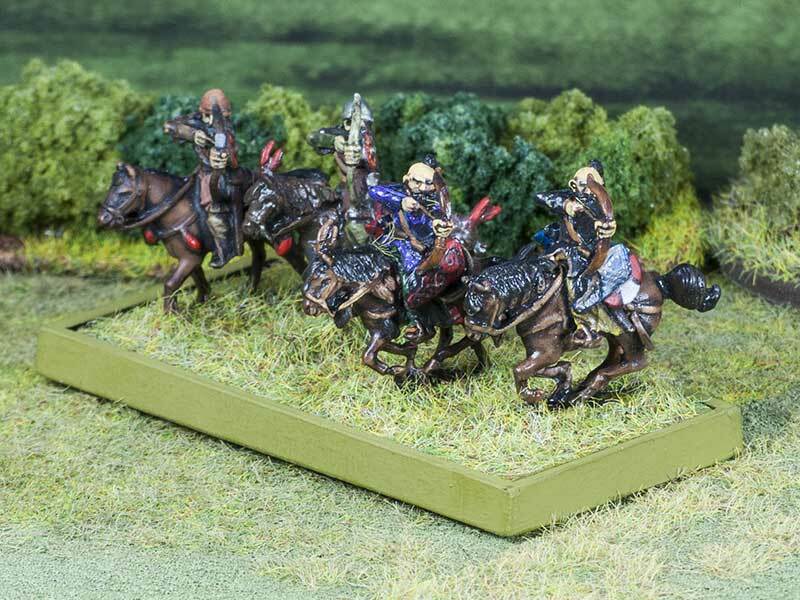 It's scaled (theoretically) for 6mm gaming, but it's about 65mm long, so it could quite easily make its way into a 15mm game too. 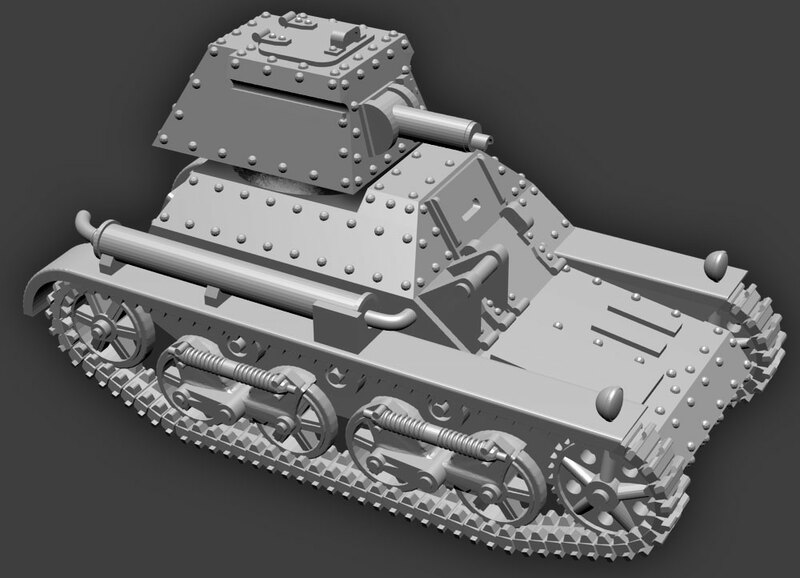 I've composited in an ancient 1/285 scale GHQ Jagdtiger, roughly to the same scale. It's quite fun not having to worry about getting angles and measurements right, and just go berserk. I think that maybe it needs some rivets. Rivets make everything better. Yet another Vickers from between the World Wars (did anybody else in Britain make any tanks at all?). 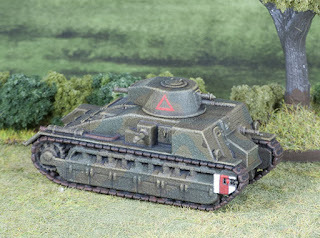 This is their Light Tank Mk.IIa. The Brits were led into a completely false sense of the usefulness of these little vehicles by using them to police their empire, against people without the ability to shoot back on anything like equal terms. By the time WWII rolled around, there were thousands of this thing's descendents in service, and as soon as they went up against other armour — even light armour — they (and more importantly, their crews) were slaughtered. 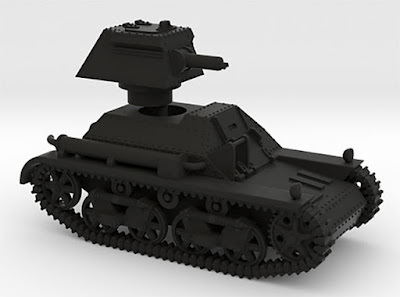 It's up on Shapeways at http://shpws.me/LP94 in 15mm (1:100) scale, starting at about nine bucks. 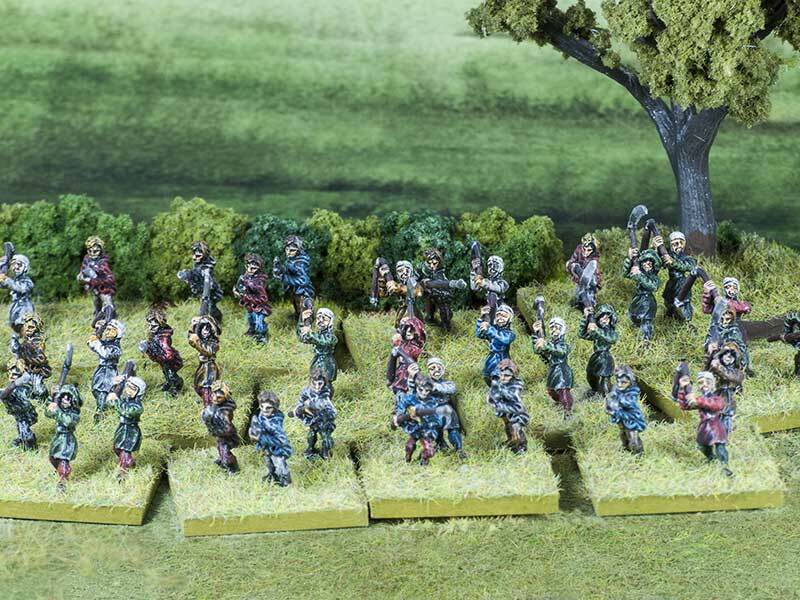 And now the 28mm version is there as well, at http://shpws.me/LPfp. It's more expensive, starting at about nineteen dollars. 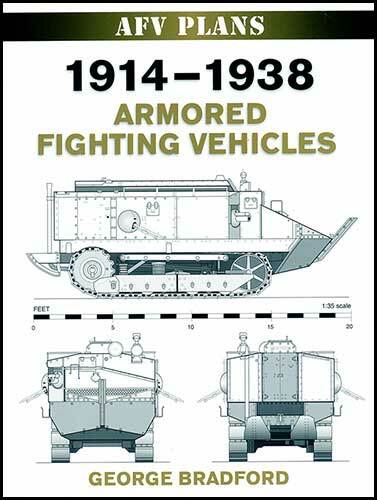 Just arrived from bookdepository.com is this cornucopia of scale drawings of WW1 and Interwar AFVs by George Bradford. It cost me about twenty bucks, and the drawings are excellent. 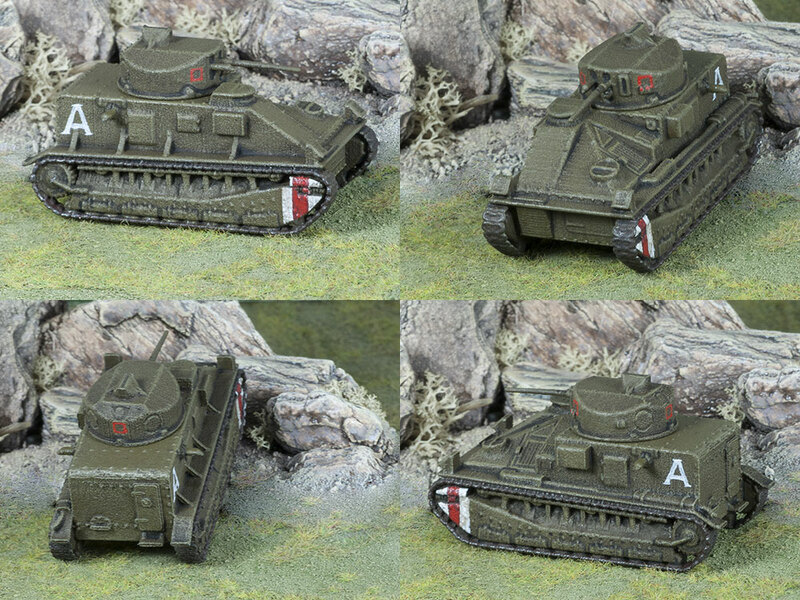 Regrettably, it doesn't include drawings of one specific vehicle I want right now, which is the Vickers Light Tank Mk.II (and III). I'll just have to do what I can from what photographs I can glean. Shapeways "Black Strong & Flexible" aterial render. After trawling my way through a whole bunch of photographs of vintage trucks in various states of dilapidation, I've mocked up sufficient chassis detail for wargaming purposes. It's guaranteed not to be very historically accurate, but it gives an idea that there's more under there than just a flat bottom. The model is now available from Shapeways in 15mm and 28mm scales. The original was developed in Italy in WW1 for use as an APC, and was widely exported between the wars: they were used in Ireland, where there is still a beautifully restored example. There were some still in service in WW2. 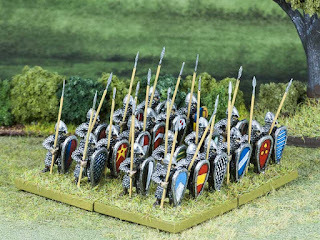 The Irish example has an A-frame wire mesh tent over the open troop compartment, to ward off bricks, bottles and bombs. I haven't included the frame because it increases the cost of the 3d-print substantially — it inflates the amount of machine space required for the the print, although the increase in material required is tiny. 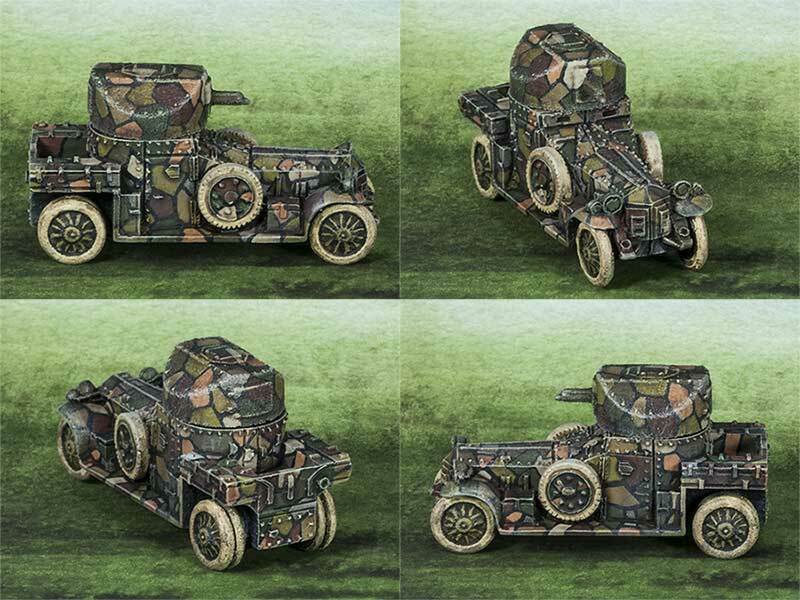 My next project, while I'm waiting for my Big Boy's Big Book of Big Plans to arrive from bookdepository.com, is a Lancia armoured truck of about 1921. It's all pretty straightforward, except in one respect: I have only the haziest notion of what goes on underneath a truck. The drawings I'm working from show front, rear, and side elevations, with no details at all of the chassis, suspension or steering linkages. I have a photograph of a restored vehicle that gives me a glimpse of the front suspension, but that's it. I guess the thing to do is to fake it.